Two months since I have found time to blog. I was trying to do it as much as possible but, work and family became hectic. What has happened in the 2 months since my last post? I am down to 95KG which is a total of 9KG lost since January. 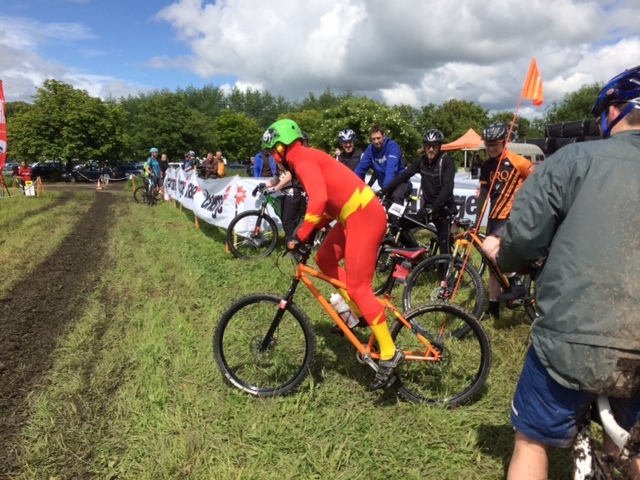 I have bought a mountain bike (Kona Hei Hei – for the tech heads), have let my weekly total drop to 20 miles a week (meaning I have only totalled 700 miles this year), competed in a 12 hour relay mountain bike race and have tried to get mileage back up again in the last couple of weeks. These last two months have been crazy with work. I have been struggling to get the motivation to cycle while giving work my all. It has been an unusual 8 weeks, so I am hoping to get things back to normal. I have come on holiday with the family this week to reset the mind and body. 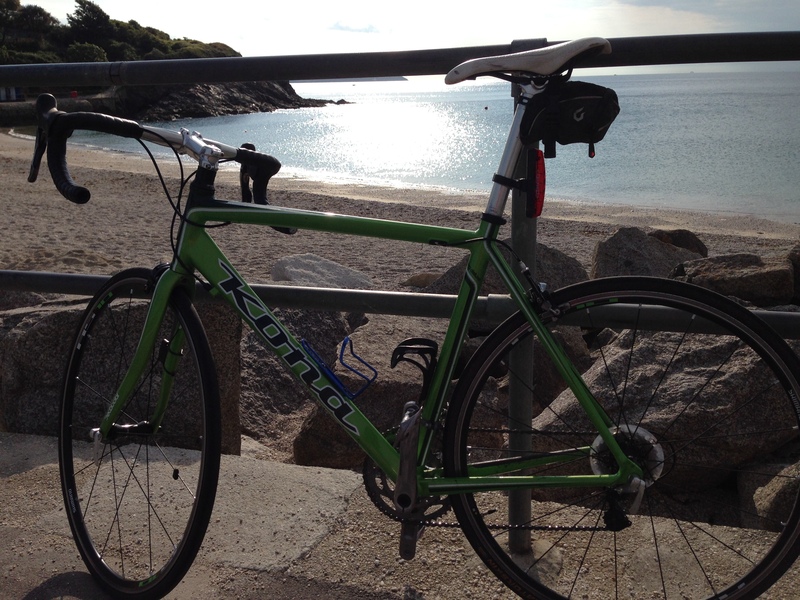 It has been great, I have managed to get 10 miles in a day and around Falmouth that is just up and down. The roads all start with sharp steep climbs with equally steep downhills. In 10 miles I have been averaging 1400 feet of ascent. 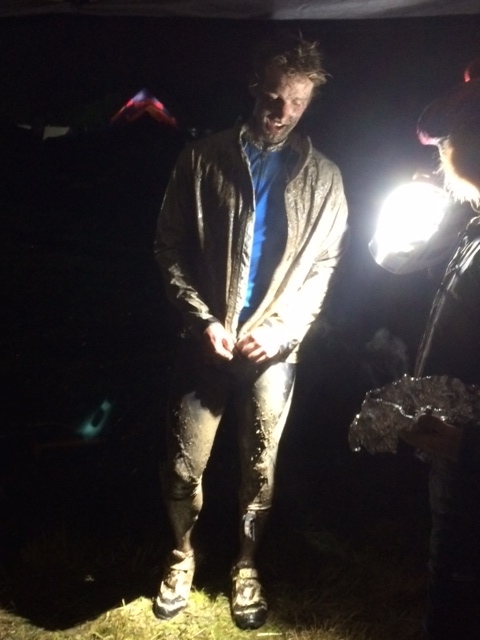 Last weekend, I went on a great friends stag weekend. It must have been one of the best stag weekends of all time. No forced drinking and stupid night clubs where you spend tonnes of money. 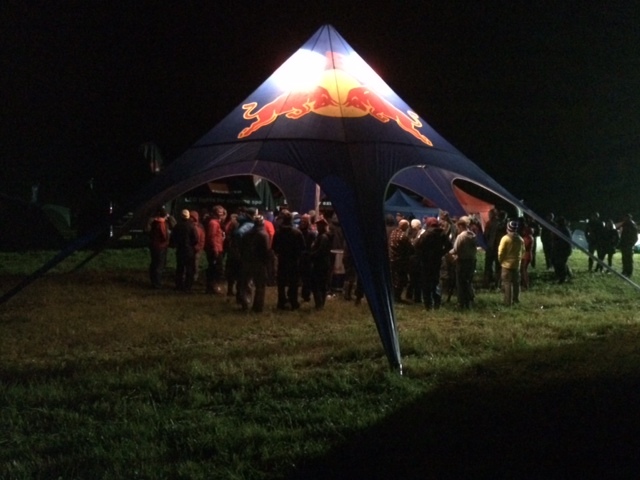 Instead we did a 12 hour mountain bike race at Erlstoke. Guess what? We even podiumed. 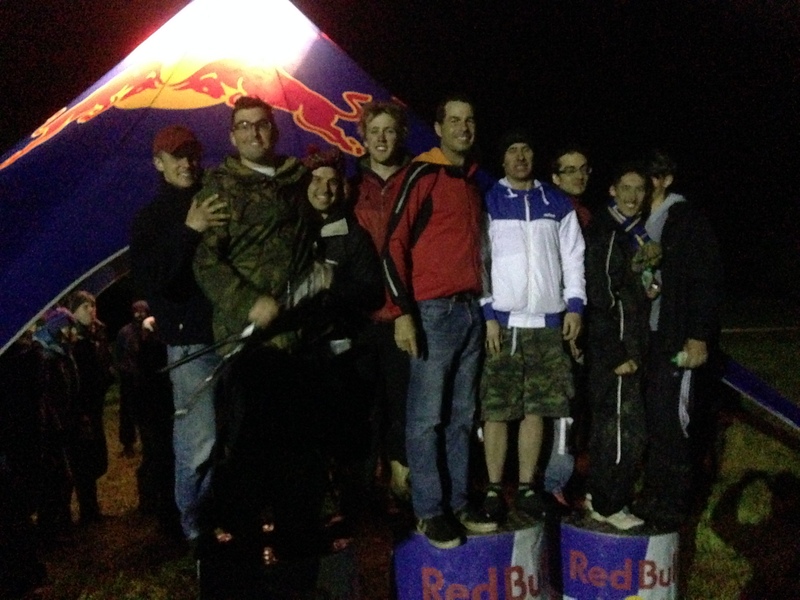 We came 2nd out of the whole field. I got a new set of Truvative bars for the Hei Hei as a the prize. In terms of diet, I have kept up the 5/7 diet and added in natural green juices for breakfast every day. Which is a an elixir for life. Great to give your body all the natural vitamins and nutrients one requires. It has also helped to get me more into shape. The holiday may have set me back slightly on goal, as it has been indulgence fest. I figure that everyone needs to release at least once a year. However, I have been cycling 10 miles a day. Time to cycle, juice, work and have fun like never before. 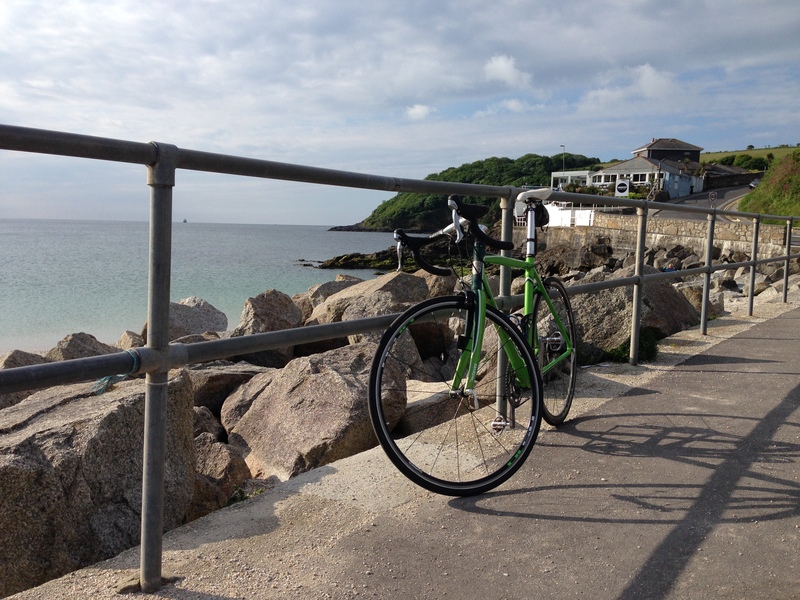 Goal for June – kick it to 93KG (keeping the weight slow, so it remains off) and cycle at least 10 miles a day with a couple of 40+ days chucked in for fun too. Amazingly it worked…….that is, posting blogs focuses my mind completely to cracking on. ” I’ve found that doing the “good things” over an extended period have resulted in quite a different impact than over a shorter period (a month, say). This probably sounds obvious, but I hadn’t realised how much time some things take (to start to lose “love handles”, for example). What a great comment and it definitely helped me get on my bike when my body was saying noooooooo. It is so true that doing the “good things” as Paul says is the right thing to do over an extended length of time. We all know it. We all know what we should be doing. So we do we need something like a life altering wake up call to stop us eating comfort food in front of the TV. My belief is that it is all down to programming. Society has been programmed by adverts that are compounded by your peers buying into them, that eating junk food or snacking is the way to relax. I think once in a while absolutely. But are bodies were not designed to get self gratification from living others lives through TV and chomping down on fatty salt filled snacks. I know this, you know this, so why does it A. feel so good at the time and B. taste so good that it is basically addictive. The right thing is hard. But in the long term far more rewarding for ones soul or out look on life and ones health. So I must keep up the meditation and re-program my mind to realise that if I am watching TV then the delicious taste of fruit or better yet, nothing is as fulfilling. On top of that I am going to ask myself – could I being doing anything else right now that would allow me to get more out of life from using my body, even if it is tinkering with my bike, or spending time to prepare a fresh tasty meal from fresh ingredients. The best ones for me obviously involve Mrs. Fatcycles or second to that my bike. Side NB. Celebrating holding up my fasting day yesterday while on a business trip to Vienna. I have had an interesting February so far. Oxford University is incredible and one of the most inspiring learning experiences I have ever entered into. It has definitely added a bit to the already packed timetable for the next 12 months. Due to this and more trips to the UAE I have only racked up a dismal 54 miles for February. My weight has maintained the same and I have discovered that wheat really does not agree with me. While being rather low on self discipline during last weeks lectures and trying to balance the office while absent, I broke rather spectacularly. I was low on energy and the only food available was pasties. So I had 2 Danish pasties. My stomach then told me how stupid I had been, I ended up with stomach cramps and less ability to focus. The positive is that, it is a great lesson learnt. So next week, I have decided to do my ‘week of pain’. As discussed in January, I wanted to try different diets and lifestyles. I have always been interested in trying to juice for a week. The ‘benefits’ seem numerous, however it is essentially a starvation diet. While doing this I am also going to see if I can cycle for 25 miles a day and complete 175 miles in 7 days. I will update during the process. I have a trip to London which will be interesting as I am not sure how I will get the miles in on that day but we will see. The whole point of trying these things out is seeing how hard or easy it is to fit in with regular life. Will I end up with no energy??? Or will I find an amazing inner strength and calm while my body cleanses itself?? Sitting on a flight back home from the UAE for the second time in less than a month. 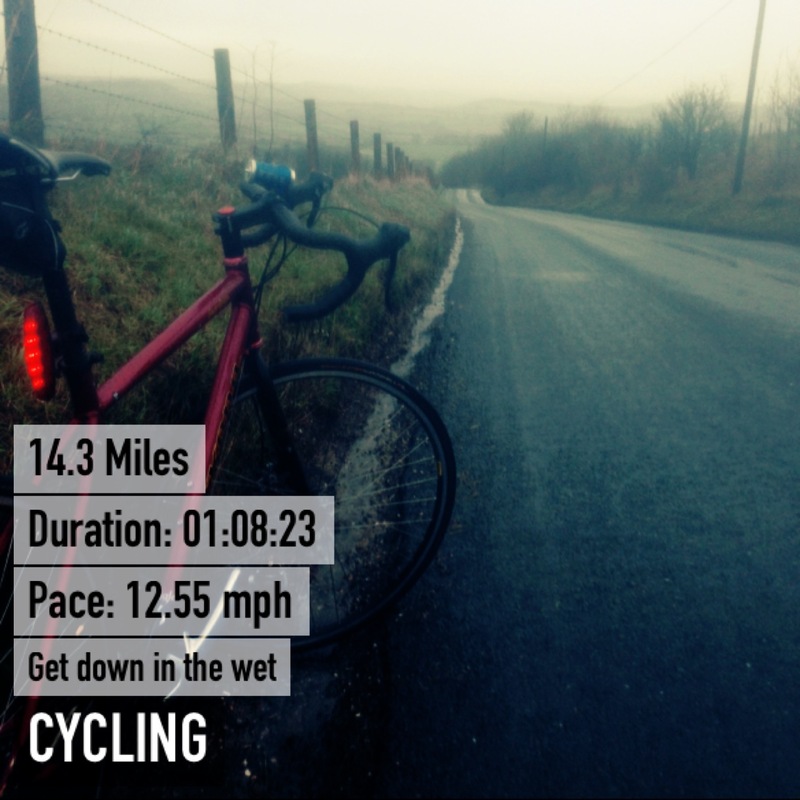 And February was supposed to be my ‘month of pain’ which at the moment is fast becoming the month of ‘lack of cycling’. The F1 track was closed to cyclists as they had Le Mans 24 hour testing. That in self was pretty cool but did not add to my goals. I also have missed a fasting day and have eaten like a stuffed pig. So all in all not the start that I had hoped for. 1. Take on your challenges one at a time. How long was your New Year’s resolution list? How many items have you ignored. If you want to shake a particular habit (or build a good one), you should focus on one major change at a time. Start, for instance, with your resolution to check Facebook or Twitter only twice a day; then, once you’re free of that habit, move on to your new diet and exercise plan. In short term, the amount of will power you have is fixed, and overloading yourself with new tasks that require it may diminish your ability to accomplish any goal. Frenzy is an emotional state, a feeling of being a little (or a lot) out of control. it is often underpinned by anxiety, sadness, anger, and related emotions. Emotions are processed by the amygdala, a small-almond shaped brain structure. It responds powerfully to negative emotions, which are regarded as signals of threat. Brain studies has shown that activation of amygdala by negative emotions interferes with the brain’s ability to solve or other cognitive work. Positive emotions and thoughts do the opposite – they improve the brain’s executive function. In other words small steps to big goals and one at time. Focusing on positive thoughts will allow your brain to help you reach your goals. 1. I have been excepted into Oxford University for an Exec Diploma, which I never thought in a million years I would get onto. It starts next week. 2. I have not gained weight. 3. My new bike is ready on Monday……. I am planning to get some serious miles in and learn allot. Focus on the positive the rest will follow. I had to share that unbelievably this fasting 5:2 diet, is actually working. It is probably a combination of the 175 miles on the bike, 5:2, no alcohol and no wheat, but 16 days in and 4KG down. So, frankly right now, I don’t care which one it is, I am just excited. I am not missing the wheat or alcohol and the headaches have now stopped. Had the most brilliant ride yesterday. 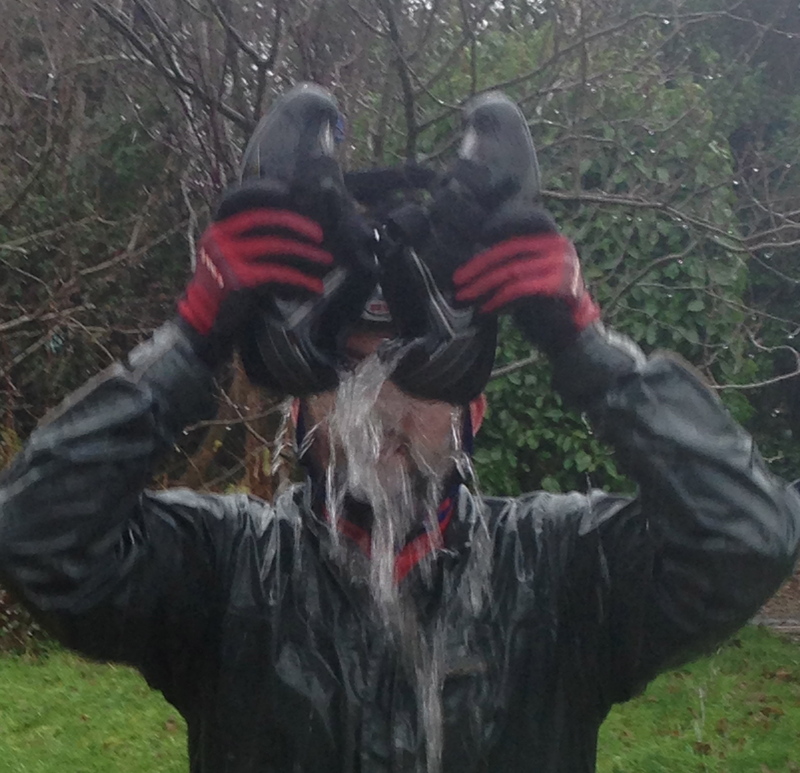 Well done to my cycle buddy who put down an impressive 14 miles in the sideways rain today. I am waiting to hear back from the Fred Whitton Challenge, fingers crossed. On top of the world with a cracking sunset. Click on the pic for a better view. What a great day. So much energy. Today, I went for a ride with my eldest son, Jago. He easily managed 5.2 miles on rural roads. See instagram feed on the right hand column. I then felled 3 trees, cross cut the wood and split it for my in laws. They think something is very wrong with me. After a lunch of Chicken and avocado I proceeded out on what was to be a leisurely hour ride. But what happened was unexpected. I climbed over 2,400 ft, rode for 30 miles and got 4 personal bests on Strava. After the first climb (which was created by the devil himself for fat guys to cry at the top of), I cycled over to my other least favourite climb 10m miles away and climbed that too!! 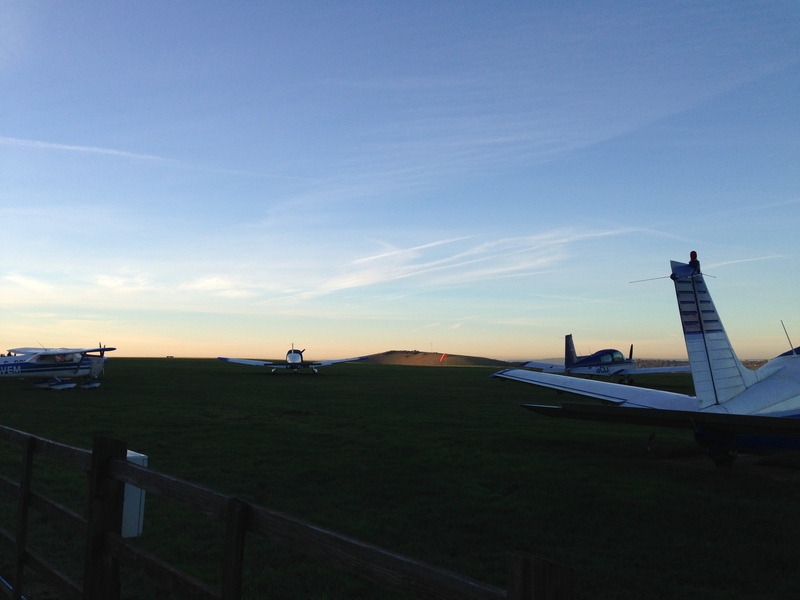 Planes, bikes and beautiful views what more could FC want. What is up is with me? I think there might be something in this but I do not want to jinx it just yet. The question is, do I jump on the scales to find out if it is working? I feel slimmer and Mrs. FatCycles is saying that I look slimmer, but she is very kind and slightly biased. Well I am going to treat myself with some Green and Blacks Chocolate and revisit the ride by staring at my stats on Strava. Oh and one last thing. If you are crazy enough to give up alcohol for a month like me. I have discovered a great trick for dinner parties. I have been putting a bottle of Shloer – fizzy grape fruit juice – in the fridge. When topping up guests with wine, I re-fill my wine glass with Shloer. No one questions it and thinks that I am drinking wine. This is great because for some reason when you are not drinking everyone feels the need to encourage to drink with them. This negates that. Added bonus of no hangover and loads of energy for the nippers. If you’re pursuing Strava KOM segments, new from 4iiii (read: four eyes) is the Cliiiimb that provides real-time audio and visual feedback, along with heart rate chest monitor. Simply download a Strava app, link via ANT+, and when a segment begins, you can race against the time of another rider or your own PR. The unit attaches to your sunglasses. Released in November, the Cliiiimb Pro retails for $199. This is re-blogged from those awesome guys at bike war. I could not get the video to upload while re-blogging. If you are into bike war is a great blog to follow. An unexpected surprise – Part of having to get up to meet your cycling buddy means you might get to see things you might have missed if you were still wrapped up in bed. I would suggest that if you are getting into cycling or have just got into it, get yourself a buddy. I was cycled solo for years. I didn’t want to slow anyone down or get pushed past my comfort zone. But I have to admit cycling with a buddy has really opened up my cycling. My cycling buddy is a lot fitter and in better shape than me, therefore at his standard pace I really am having to push. It has got me beating personal bests on Strava and it is great to have someone to gossip about cycling with – not what Mrs. FatCycles considers a great topic for conversation. 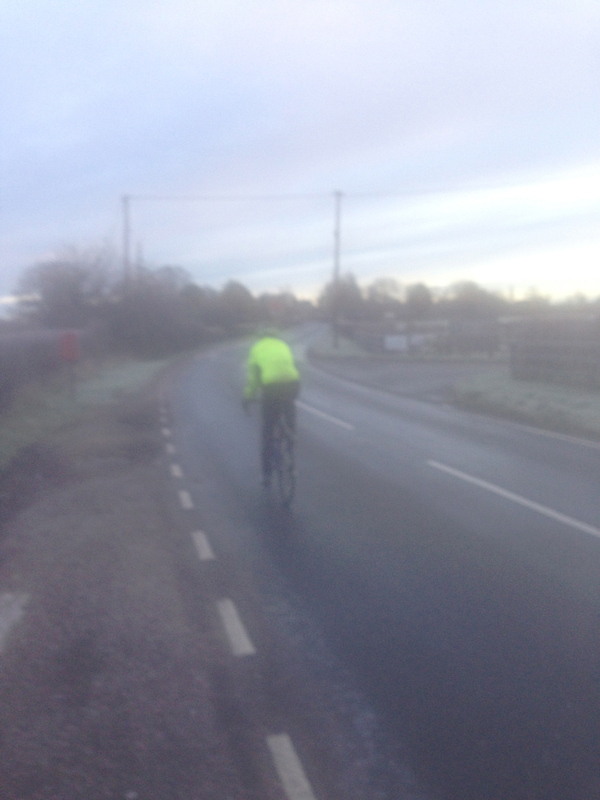 ‘Ice and Slowly, capturing my cycle buddy. Although my iPhone bag seems to have misted up somewhat. I promise you will get more from cycling, get fitter, meet like minded people and have a laugh. Another wet day. Mrs. Fat cycles helped capture the moment of water logged shoes.